Shakespeare obviously loved historic Stratford Upon Avon, the town in which he was born: although he went to work in London and made his career and his fortune there, he maintained the strongest links with Stratford. 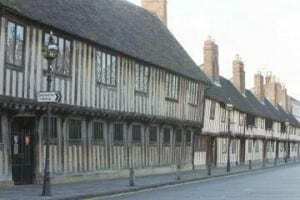 He visited his family and his Stratford friends regularly, he bought property in Stratford, and he involved himself in the affairs of the town. Situated right in the centre of England, Elizabethan Stratford was an important river-crossing settlement, market town and regional centre. A striking medieval bridge spanned the Avon River, which ran throughStratford, and farmers and people from other towns and villages attended the weekly markets. The market building (burnt down in 1826), the place where Shakespeare’s father sold the gloves he made, would have been one of Shakespeare’s most familiar sights throughout his life. Stratford received its borough charter in 1553, just eleven years before Shakespeare’s birth and his father, John, became Bailiff (mayor) of Stratford when young William was three years old. By that time John Shakespeare had become prosperous enough to buy two adjacent houses, which he made into one. That was the house on Henley Street, now known as ‘The Birthplace‘, and that was where Shakespeare grew up. As the son of a leading Statford citizen, William would have attended the Grammar School, which still stands on the corner of Church Street and Chapel Lane. It is not known what Shakespeare did when he left school. In November 1582 he married Anne Hathaway, the daughter of a local farmer, Richard Hathaway. 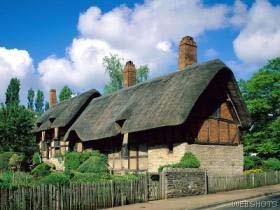 Her home, now known as ‘Anne Hathaway’s Cottage‘, still stands in the village of Shottery, a mile from Stratford. 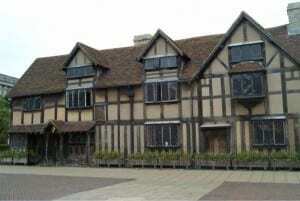 Shakespeare left Stratford in 1587 or 1588 and went to London. By 1592 he had made his mark as an actor and playwright. 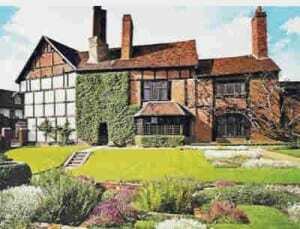 He earned good money doing that because he bought New Place, one of the biggest houses in Stratford, in 1597, and installed his family there. Are you heading to Stratford Upon Avon? 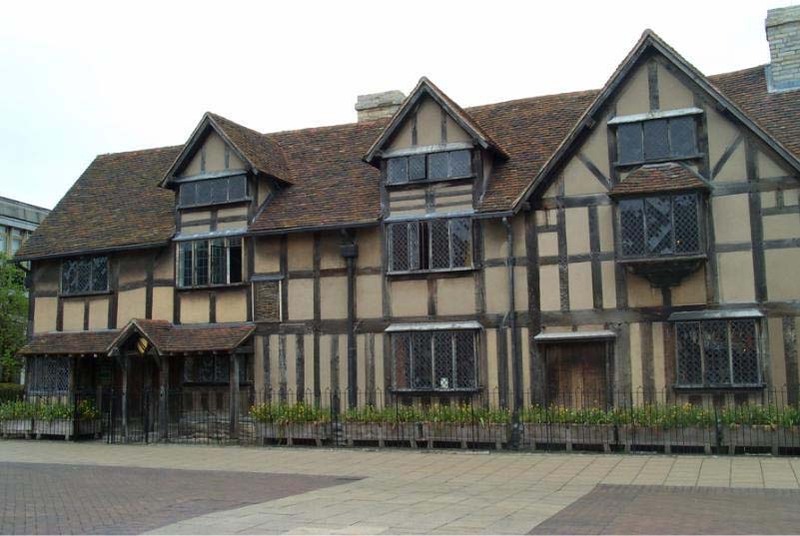 Read an online guide to Stratford Upon Avon, or details of Shakespeare’s Stratford-Upon-Avon, including attractions, entertainment, theatres, eating out, shops, hotels, bed and breakfast, cottages and more. Nice pictures, and a nice site. Thanks. It’s nice to see someone else so devoted to Shakespeare!